As the flow of capital throughout the world increases, and retailers and investors chase diversification and strong returns, the U.S. retail market is attracting more time in the international spotlight. JLL’s latest research anticipates a measured and selective uptick in cross-border retailing and capital flows into the U.S. in the coming year. Global capital markets competition is pushing overseas investor demand for U.S.-based retail assets, as evidenced by the $5.49 billion foreign investors funnelled into 134 property purchases this year, marking a six percent increase year- over -year. 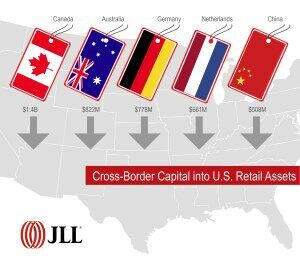 According to JLL’s Global Capital Flows report, the top five countries placing capital into U.S. retail include Canada, Australia, Germany, the Netherlands and China. These five countries contribute more than three-fourths of the total foreign direct investment into U.S. retail real estate. “The U.S. has always been a target for foreign capital, but we are finally seeing investors going outside their typical comfort zones, moving further on the risk spectrum and adding retail assets to their portfolios. This shift has increased the price per square foot for retail transactions higher than any other asset class this year, creating stiff competition for trophy assets and an uptick in interest for grocery-anchored strip centers,” said Margaret Caldwell, Managing Director of JLL’s Capital Markets. Caldwell says global funds are increasingly eyeing secondary markets to support their long-term hold strategies. Markets that have a growing middle-class, lower barriers to entry and slim competitive set, such as New Jersey, Tampa and Cincinnati, witnessed that injection of foreign capital already this year. Categories: Americas Retail, Global, ICSC Events, Retail Capital Markets and tagged Capital Markets, Foreign, Global Capital, International INvestment, Margaret Caldwell.